Once upon a time, not so long ago, I declared that reading is social. I don’t think it’s possible to become untethered. Neither do I wish to become unplugged from the social aspects of reading. However, at times I do feel somewhat conflicted about it. Once in a while pre-publication hype wears me out. That’s why part of me yearns to read off the radar (again). Hyped up books are on everyone’s radars while underrated books somewhat seem to escape those very radars. Then there’s this one huge radar that you almost can’t escape if you read book blogs, watch booktube and/or follow bookstagrammers. You know what the most popular upcoming releases are because everyone’s gushing about them. On a more massive scale, it encompasses books a multitude of bibliophiles have read — The Hunger Games, Divergent, The Fault in Our Stars, Outlander, and not to mention, Harry Potter. Of course, there are many more examples beyond these books. Books on the radar very surely have their merits. They did become popular for a reason. At the core, they have mass appeal. While not everyone will come to love every popular book, the essence is that many did come to love them. In a way, that should encourage an even bigger audience since these books have been tried and tested many times over by a whole lot of readers. Setting a parallel with travel, popular books are akin to popular destinations. They encompass Santorini, Paris, Rome, the Maldives, Bali, and so forth. All of these are lovely places, no doubt. Barring the fact that I’ve been to Bali, Rome and Paris, the more photos of these popular travel destinations I see, the more I yearn to travel elsewhere. Maybe seeing the same photos on Facebook over and over again makes me feel like I’ve been close enough to those places. Similarly, seeing the same covers everywhere as well as book review, after book review, after book review almost makes me feel like I’ve already read the books. Naturally, I know I haven’t. Seeing a photo of a place dwarfs the experience of actually setting foot on its soil. Reading a book review is nothing like reading the actual book. These sentiments stem from my constant search for new experiences. A partial experience, however slight, undermines that. The element of surprise loses its impact. In light of this desire to call discoveries entirely my own, I yearn to read books that are off the radar. Between two books that sound equally appealing to me, I tend to reach for the lesser known book of the two. Should they both be popular, I will more likely read the book of which I’ve managed to read less about. The more I can trek off the grid to find something truly amazing, the more excited I get. Once in a while I get ahead of myself and mark books way before their release dates. Their synopses sound intriguing or I’ve loved books from those authors before. When I stumble upon these books myself, I derive much glee and the anticipation builds for the chance to trek off the grid with these books. Alas, the early intent to read a particular book occasionally lands me right back on the radar. Prominent examples to me of when that happened are Paperweight, Passenger, Aristotle and Dante Discover the Secrets of the Universe, Ink and Bone, and Made You Up. I found these books independent of recommendations and hadn’t seen those books around until after I added them to my list of books to read. Over time, others arrived and picked up on these titles, making it impossible to satisfy my yearning to read off the radar. Whenever this happens, I’m faced with choices: celebrate, surrender or lose. To lose means to forgo the book entirely. That’s a route I will choose if ratings are so dismal, I succumb to reading spoilers. Spoilers are such a deterrent to the enjoyment of books, I basically lose the will to read said books. One step up is to surrender. I read the book but accept that the hype has gotten to me and my expectations have reached unrealistic proportions — I’m all set up for a likely disappointment but my original interest will carry me through. During these circumstances, I try to remind myself that the book hasn’t inherently changed for the worse or better. Hype or the absence of it are circumstantial and technically don’t have bearings on books. They’ve been written and published, thus the word remain the same, regardless of how their reception. The last option is to celebrate. Undeterred, I set forth to read the book. There are two ways about it: 1. I’ve managed to maintain complete ignorance of the content of the book despite it floating around everywhere ; 2. Others have become so starry-eyed that I want in. In the face of my excitement though, I try to pick up on things that others have glossed over. In a way, this expands my range of experiences and so makes up for my wariness over the popularity I previously hadn’t factored in. Depending on the book, I find myself following these three paths when faced with a book that was off the grid but has come to be on the radar, ie. pretty hyped up. The will to celebrate does show that not every book has to belong to my quiet sphere. I can readily accept and even enjoy the shared love for a whole range of books. Still, I also like going my own way once in a while. This is becoming increasingly difficult, hence my yearning to read off the radar. A core difference between travelling off the beaten path and reading books that not many have heard of is this: the former generates extensive conversations due to the curiosity over your adventures. The latter results in much lower engagement. When it comes to books, it is easier to discuss them when you know what they’re about. On bookstagram, many tend to double tap on photos that feature familiar covers. On blogs, readers show lower interest for books they’ve not seen anywhere else before. It’s an odd dichotomy — the claims to searching for new books is undermined by perpetuating the popularity of already hyped up titles. Do you sometimes have the urge to stake a claim to a book? To declare it your personal discovery best left untouched in the wild? 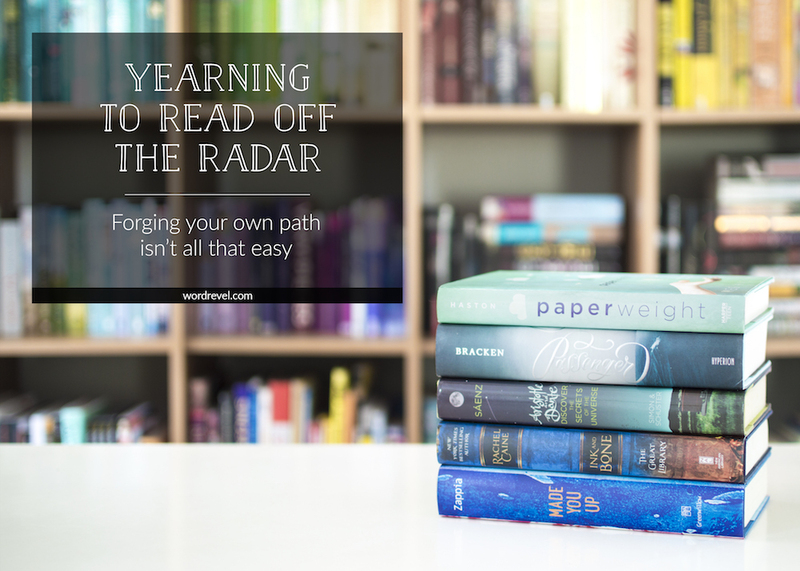 Hello,I check your blog named “Yearning to Read off the Radar | Word Revel” on a regular basis.Your writing style is awesome, keep doing what you’re doing! And you can look our website about fast proxy list. YES I DO HAVE THE URGE TO STAKE A CLAIM IN A BOOK! :D :D This post ^^^ this post! The first time I experienced… oooh what’s it called? Over hype syndrome? Was with Six of Crows. I just got finished reading the Grisha Trilogy. I claimed Leigh Bardugo as my favorite author. I WAS PUMPED TO READ THE BOOK! But then I kept seeing review…after review. AFter review. AFTER REVIEW! Of the book. I stopped caring. I deleted the email notifications. Scrolled past the posts on my various social media feeds. I was sick and tired of seeing all this hype over Six of Crows (deserved hype, admittedly, but it was exhausting). Most of the time, I can be blissfully ignorant on what a book’s about. I’ll see people promoting books, and I’ll recognize the cover and KNOW it’s a big deal, but I’ll go weeks without actually reading a synopsis. It’s weird. It’s like the moment I start seeing a book trending, I block it out. But at the same time, I tend to only read those hyped up books because when it comes to choosing-your-next-book time, I go by what I know. I recognize that cover! I’m grabbing it! But then I review it and it’s like, “ugh… /I/ wouldn’t even read this.” because the book is so hyped! PEOPLE STOP READING THE REVIEWS! I’m just wanting, or as you say “yearning” to read something new to me. Something that hasn’t flooded my social media feeds for weeks. I usually can’t help myself, when I read an underappreciated title I love, I just shout it to the world and harass anyone who would stay still enough to listen. My latest love is The First Fifteen Lives of Harry August, who I am trying to press on EVERYONE. I am sure when people start declaring it as their new fave ever, I will feel a pang of possessiveness and proceed to tell everyone about how I LOVED IT FIRST hehe. There’s a magic to loving a title that no one else has commented on, though. One of the most interesting points you make (that I totally agree with, by the way) is that books can get so huge that even if you haven’t read the book, you’re familiar with its contents. I don’t know how I feel about that–I have certainly experienced it (Lord of the Rings and Star Wars, to varying degrees, are the biggest examples for me). Sometimes, it has me curious to experience the thing, to shed others’ perspectives and form my own through an interaction with the text, and others it has me completely disinterested. It dashes any care at all. I struggle with determining how that works (I suspect it has something to do with the initial level of interest). But there is also something to be said for the perspective we have as book bloggers. Books that we see over and over again are books that others, outside of the blogging community, might never have heard of. A friend of mine recently discovered the Shatter Me series, and it was a revelation to her. I know bits and pieces about the story because it was so huge on Booktube a bit ago, even though I haven’t read it, and the differences in our experiences just fascinates me. I (in some ways only barely) remember the days before blogging, before booktube, before Goodreads, and wandering the shelves at Borders (RIP) or Barnes and Noble, and picking up books I’d never heard of before because of interesting titles or beautiful covers. And I don’t really remember finding new books to read in any other way. I don’t think either side is really purer or better–I do like that I am much more familiar with a much greater number and variety of books, but I wonder how the radar shapes my tastes. Sorry for the novel, but you really got me thinking. I consider myself a pretty balanced reader. Part of me notices all of the books on the radar. I never rush into reading them though–like, I think I’m finally going to start reading Clare’s Mortal Instruments series a couple years after the hype fizzles out. Even though I don’t come across this book on blogs often anymore, I still feel really excited because I remember how popular this series was. I also know this is risky because it will still have far to fall if it doesn’t meet expectations (though not as badly because I’m not reading the book in the thick of the hype). This was a lovely post, and I definitely agree. Being a book blogger, it’s hard to avoid all the books that are on the radar, because it’s kind of our job to know and talk about those books. I personally love reading books that are rarely talked about – whether they are much older, blacklisted books, or whether they are newer releases that went largely ignored. Yup, I definitely understand you. There are times when I just want to own a book for myself. Like, I don’t want other people to read it. I just want it to be mine, mine, mine. In fact, I do have a book that I would call mine. Most people that I know have not read it, and I’m just contented for it to stay that way because I would like that story to just be known to me. I….. rarely read off the radar. :( HAHA it’s because I depend on the radar to actually recommend me books to read. I’m horrible at getting to know new books. I’m not like most booknerds who go in search of books on Goodreads, Nupe, that’s not me. I’m completely oblivious to new books, unless people on Twitter are shouting and screaming about it. But there were times when I would just go to the library and I would see a book that nobody seems to be reading. And if that book was really good, then it shall be a rare gem. Because I think the best books are those that are underhyped hehehe. Maryam Dinzly recently posted Since When Did Reading Become A Chore? YES! this post is so me. i always am trying to read unique, unhyped books, but there are just SO many hyped books and i just want to read all of them. the struggle is real.